Water leaks have disastrous consequences for home owners. The sooner a leak is found, the quicker it can be dealt with by a plumber, so that you will avoid even more water damage in your home in the future. Many people don’t know how to find a water leak in their home. The following five methods will help you to identify this problem. Many water leaks are not visible, but eventually you will smell dampness caused by a leak. To identify a leak in this way, don’t hide this smell by using deodorants or air fresheners for a few days in the rooms you think are affected by a leak. The damp smell will be obvious if you do this and you can start to take further action to identify the exact cause of a leak. Eventually, a domestic water leak will stain floors, walls and ceilings. If you think there is a leak somewhere in your home, keep an eye out for dark patches in these areas. Floors and walls may be covered, so you will have to remove anything that prevents you from viewing them properly, to see if any brown stains exist. In some instances, these stains may not be obvious, so you should make sure each room you inspect has proper lighting. A dripping sound is a clear indication that there is something wrong with the plumbing in your home. However, dripping sounds are often drowned out by background noises, such as radios, people talking and the sound from TV’s. To identify a water leak by listening, you need to have little or no background noise in your home. You can take this one step further by using a Geophone, which carries out the same functions as a medical stethoscope. This listening device is able to pick up the sound of dripping water in difficult to access areas, such as attics and underneath floorboards. Smoke testing is an effective way to identify leaks and holes in drain pipes and waste pipes. During a plumbing smoke test, non-toxic smoke is forced through each pipe. If the smoke escapes at any point along a pipe, it is a clear indication that there is a leak and a pipe is damaged. Sometimes you have to take more drastic action to find a leak. Many pipes burst underneath floor boards and tiles. This means you have to lift up floor boards and tiles to find the affected areas. This is often a hit-and-miss exercise. It can become costly if you don’t identify the leak quickly before you have removed a large number of tiles or floorboards. 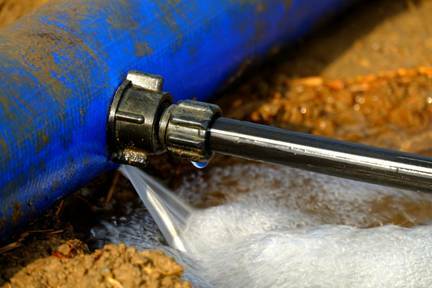 Speed is of the essence when it comes to identifying a leak in your home. However, you can react to the problem once it has been identified, so that it does not cause further damage, which could prove to be even more costly.